Back in 1986, Anne and I had heard from a friend living in Kelvedon about a new fund-raising event for the local church that had gone down well in Kelvedon and, after talking it over during the winter months, thought that we might have a try at something similar in Wivenhoe to raise funds for St. Mary’s Church. 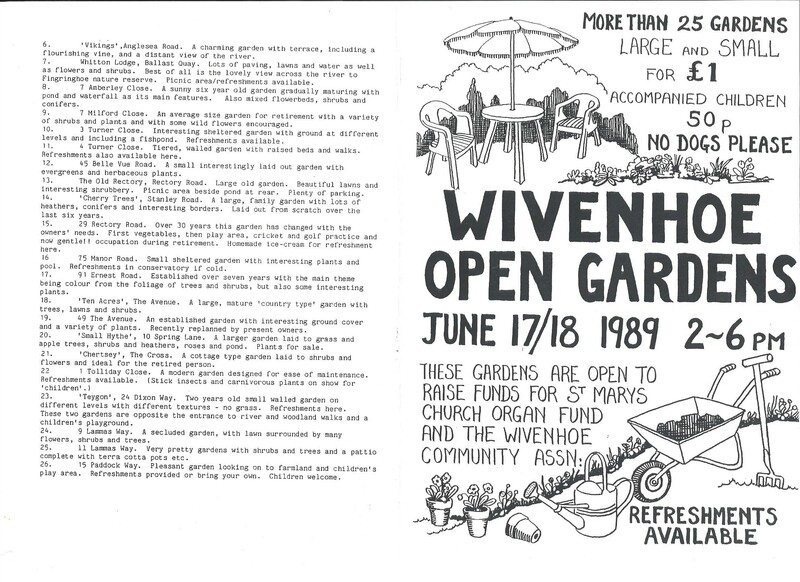 Thus during the early months of 1987 we approached a number of householders in Wivenhoe and asked them if they would ‘open’ their gardens for a specific fundraising effort in aid of Church Funds. 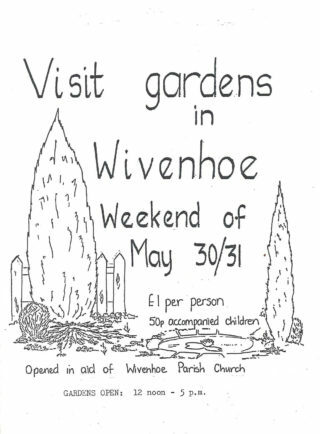 That year, in May we had seventeen gardens open to visitors, admission being £1 covering viewing all seventeen gardens that weekend, and were delighted to find that we raised some £600 or so for the Church. It was a real pleasure to hear from the visitors how much they had enjoyed the week-end. As receipts for the week end increased over the years, we were able to give donations to other Wivenhoe Charities from the funds raised, including the Wivenhoe Carers Group and the Town’s Minibus. For the next nine years Anne and I continued to organise this event. Whilst dear old Dr. Dean was still alive, we were somewhat limited in choice as regards the particular weekend selected in that it had to be held at the end of May since this was the best time of year for the display of Rhododenrons in Dr. Dean’s garden at the Old Rectory. 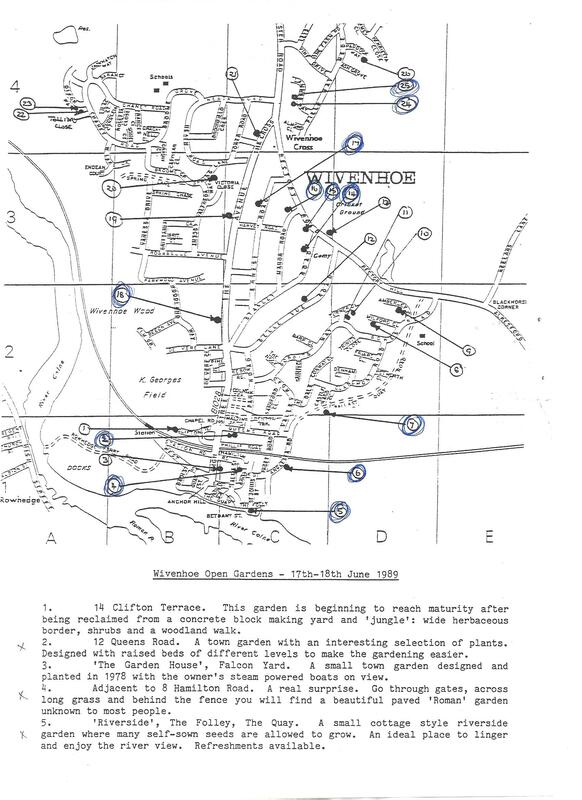 The number of gardens that opened each year became an ever increasing number and when it exceeded some thirty, we became convinced that it was now time to pass it on to someone else to organise. 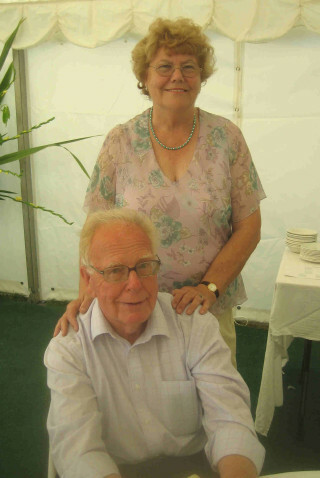 Initially Alison Webster, Rector David Thomas’s wife helped, but later the Wivenhoe Society became actively involved with the Church in organising the weekend. In recent years the event has been run by a team of people including Jane Hughes, Jeannie Coverley, Pat Smith and Dave Harrison. 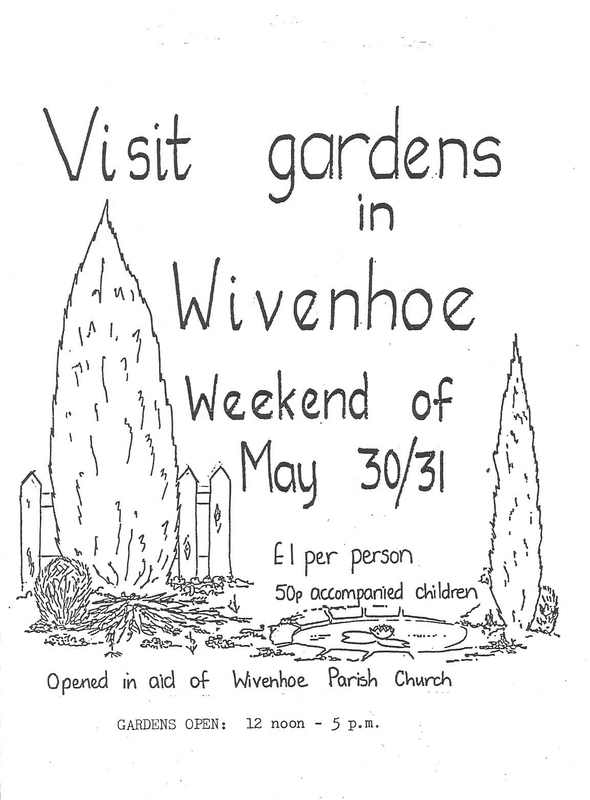 It is nice to know that the Open Gardens Weekend is now somewhat of a fixture in Wivenhoe’s calendar. We understood that in those early years it was quite something to hear that people walking down the road and seeing others with bits of paper in their hands would call across ‘Do go and see Garden so-and-so’ or perhaps, ’Don’t miss Garden No ? ?, or you must see Garden No ??. That particular week-end became one of the looked forward to week-ends of the Summer. It was even better if it didn’t rain ! 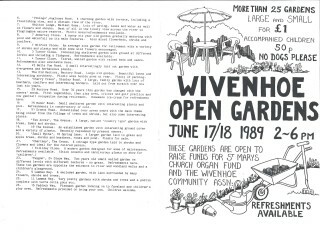 We feel that it is nice to know that Wivenhoe’s residents now look forward each year to something that in effect started on the back of an envelope and has developed into something of a Social Event in Wivenhoe. 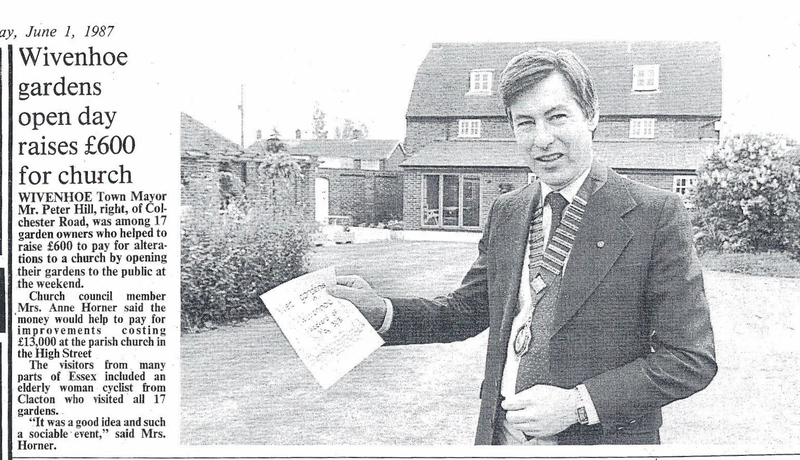 We opened our garden in those early days. I spent a great deal of time preparing our lawn – much water and fertiliser – and it looked immaculate, so much so that visitors were asking permission to walk on it because of its presentation and the way it was cut in stripes !!! 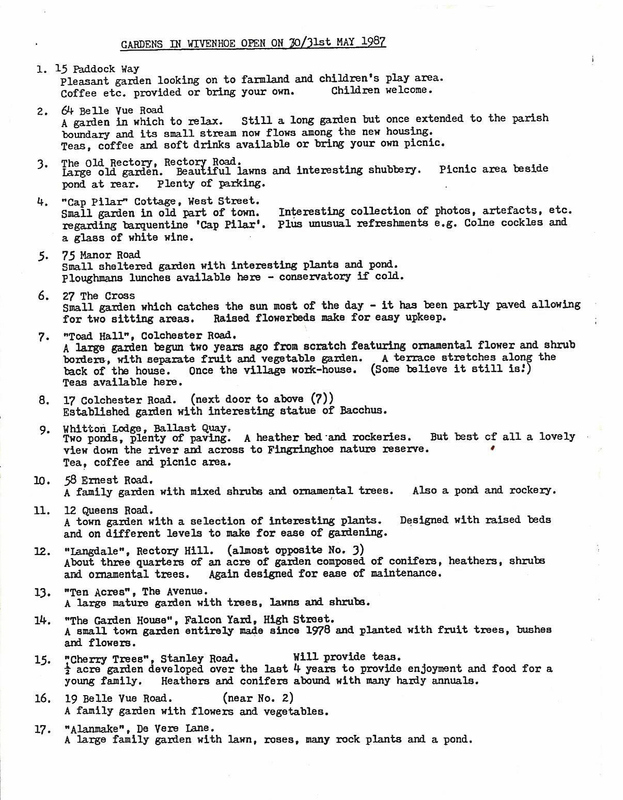 One of the attractions was Shirley’s ice-cream – so much was made in preceeding weeks that we had to beg for plastic containers for storage which were then taken down to Ken Green’s deep freezer until the Saturday morning – the only drawback was that such containers could not be used again as they smelled of fish !!! 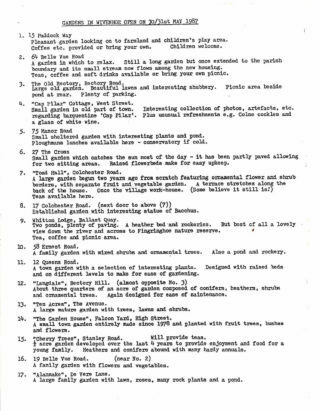 Bonnie and I were one of those 17 gardens which agreed to Anne & Len’s request and we have been open almost every year since. The garden has matured a lot since we laid it out in about 1985 and it has evolved gradually over time.